Taming the polar bears - SAMS students in the Arctic 2013 !!!! A dark green van came driving up the one road in and out of Nybyen. I was already standing outside with a rucksack on and ready for the day to come when I saw the UNIS logo stamped on the side of the vehicle as it continued driving up the hill. A group of equally prepared colleagues stood ready and zealously greeted me with a nod or a smile accompanied with a “good morning are you ready?” It was the first day of our snow processes fieldwork; we would be travelling to a nearby glacier for a week to gather data about its geophysical characteristics. What makes it move, where is it moving to now and in the future. More importantly we would be physically out in the landscape that we are attempting to gain a deeper understanding about, instead of it all just being theory. That’s the good thing about UNIS, be you a visual learning a kinaesthetic learning or an auditory learner, for any case UNIS caters for you. Although pursuing academia likely means you are good at all three, if you want me to read about how a glacier moves then sit me on one. Let me measure it moving and tell me why this is so. UNIS does this, and I believe it’s what makes this place special and effective at training new scientists. This place aims to put students out in the field and to give us the skills and tools to be able to work in a harsh environment. The weather was cold. Twenty below and feeling colder when a wind blew. Arriving at the logistics garage to be outfitted in scooter gear; boots, suit, goggles, helmet, mittens and an avalanche beacon. By the end it felt as if beyond the garage doors laid the surface of the moon. Student snowmobiles parked ready for us to take into the field. We drove them up and attached sledges to the back of them. Securing a series of scientific instruments that continued this extra-terrestrial impression of the surrounding landscape. Ground penetrating radar and Global navigational satellite system and automatic weather stations. Not only that but UNIS also provides the professionals that use this equipment, that have written papers thanks to this equipment, that now pass on the knowledge in the hope that some here continue it. We dig holes in the snow. Some metres deep. The snow pack can be removed like bricks, which makes life easier; but not much. Sweat becomes your worst enemy, for when it cools it freezes. The hair on my face and head froze in seconds. It’s always hard to thaw out frozen extremities so the trick is keeping warm. This is not easy work it can be exhausting and frustrating when technology fails to work; batteries die much quicker in the cold. We tag team the digging work and when someone doesn’t come out the hole you grab him out. When you are asked to dig you reply with gratitude, “thanks for allowing me to warm up.” We all share in a laugh and take the measurements before we heartbreakingly fill the same hole back in with all the snow we just removed. Leave nothing but footprints. 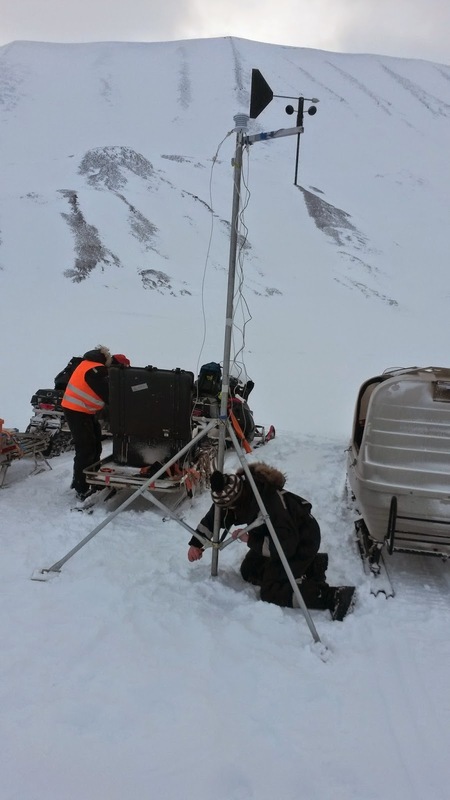 If you were to disturb the snow then measurements may be jeopardised; such as with radiation sensors. If we were to dig up most of the glacier and leave it like that it would destroy much of the natural beauty and would present a danger for scooter drivers. Science would start to be less effective at getting its messages across. Jump on the scooters for a quick leg up the hill to where the sun has managed to emerge over the mountain ridge. Some food and stories from the professors help to warm up spirits whilst the hot drinks and a few more layers help to warm your body. Before you know it the day has ended and just as quickly so has the fieldwork. The sights the work and the people make this a memorable experience worth a few stories. You can learn all there is to know about UNIS and its goals for future scientists by spending one day out in the field.